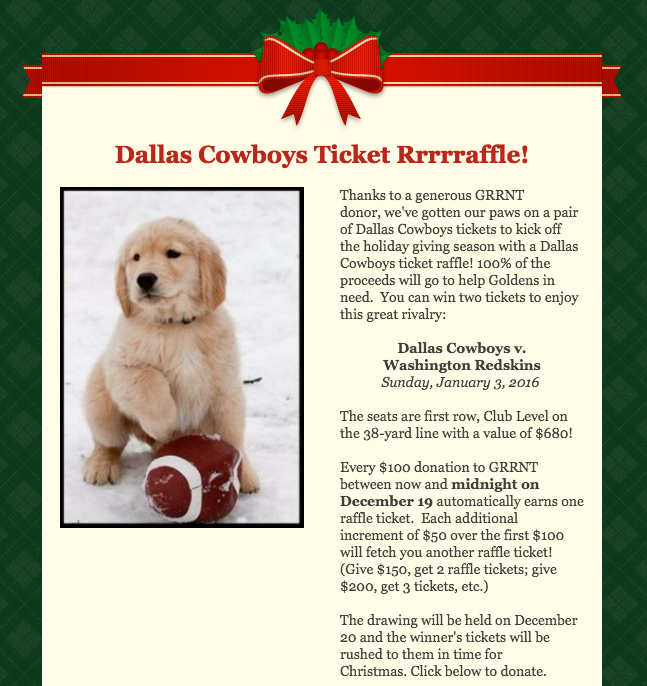 Golden Retriever Rescue of North Texas (GRRNT) is a 501(c)(3) nonprofit charitable organization dedicated to providing new beginnings to homeless Golden Retrievers. We focus on cities in North Texas and Dallas - Fort Worth (DFW) including Dallas, Fort Worth, Allen, Arlington, Burleson, Carrollton, Cleburne, Colleyville, Denton, DeSoto, Flower Mound, Garland, Grapevine, Irving, Lewisville, McKinney, Mesquite, Paris, Plano, Richardson, Sherman, Tyler, Waco, Weatherford, Wichita Falls, and others. As with any non-profit organization, GRRNT relies on the generous support of our local community to continue our operations. While we collect adoption fees from new owners, this seldom covers the cost of care for our dogs. Contributions provide for the medical care, rehabilitation, and placement of these wonderful dogs. During 2009, GRRNT spent over $149,000. So far in 2015 we are on pace to spend over $175,000 (over 90% of total expenses) on veterinarian bills. Remember...the adoption fee is $200 to $350 and there are always additional costs associated with each dog. Without regard to cost of care, GRRNT accepts all Goldens in need of rescue. Many times the care of these neglected dogs runs into the thousands of dollars! Donations are tax-deductible and 100% of all donations go toward caring for Goldens in need. For your convenience, we offer online donation using major credit cards. When submitting your online donation with your credit card, all your personal information remains private and confidential. Your credit card and personal information is never transmitted in the open and only authorized staff members have access to your personal data.